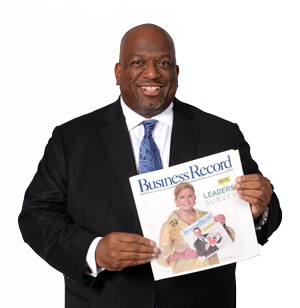 For our annual Business Record Leaders Survey, we surveyed the Business Record audience on 16 business issues in order to capture the pulse of our readers. Below we have the results of all the questions along with selected comments from our readers and from our guest voter Michael Sadler, an assistant vice president at CenturyLink, and analysis of each question from our senior staff writers. The results are far from scientific, but the responses to our online survey provide a peek into the behaviors, beliefs and general mood of the community — and in some cases, how those moods have changed over time. We couldn’t have done this without you, the leaders of our community. So, as always, a big thank you to the hundreds of leaders who participated in our survey again this year. How stressed are you feeling at work? Rate the overall health of the central Iowa business community. 4 – Agriculture and construction manufacturing dominates the region, and both are struggling right now. 6 – We still have many issues to tackle to achieve greater health in our business community — e.g., regulation, taxes, fair pay for women, diversity, angel investors. 8 – Economic activity is brisk. I have some concerns that real estate development is nearing a bubble phase. 8 – Our businesses are continuing to grow along with our city. We are a city where businesses very much support one another. 8 – Central Iowa is firing full tilt. We are probably at or even exceeding full employment, and the financial, real estate (residential and commercial) and business services industries that drive the Central Iowa MSA are all working. If anything, I would say we are a bit too “Goldilocks” right now, especially on the commercial real estate side. I think we are beginning to see some cracks in that foundation in terms of additional supply in warehouse, office and multifamily. So 24 months out, this could be a very different environment. 9 – Unemployment here is some of the lowest in the country, and our charitable nonprofits continue to be supported. Construction is up around the region. Things are generally good. That should not be misconstrued to mean everyone is doing well, as we have a sagging ag sector at this time. How optimistic are you about the job market outlook for your particular industry? MICHAEL’S RESPONSE: 7 - The telecommunications industry has some short-term challenges as we deal with the state of competition, particularly landline losses, as consumers change the way they communicate to an IP-enabled environment. Over the longer term, today’s substantial investments in broadband technologies will yield positive growth in an essential industry. 7 – The job market is there; it’s finding the people to fill those jobs that has me worried. 5 – The restaurant industry is one of the last bastions of entrepreneurship where you can start as a dishwasher and end up an owner. That being said, I’ve never seen such an oppressive regulatory environment. It is strangling the dreams and opportunities of young restaurateur entrepreneurs. 7 – The legal community in the Greater Des Moines area does not see the extreme fluctuations that many large cities do. The legal job market should be good for qualified and experienced attorneys. 8 – I don’t see our industry slowing down at all. 8 – It’s good. High-paying jobs are available and seem to be increasing. 2 – We have seen major workforce shortages in our industry from construction professionals through the skilled trades. This is a major concern for our industry. MICHAEL’S RESPONSE: Under – The technology for driverless cars exists today. The question will be “How quickly will our infrastructure be redesigned to accommodate the technology?” I would expect some of that work would be done prior to 2030. Under – This will be a major disruption in the automotive industry, and there will be a fight to grab/keep market share. There is huge demand for this technology in the trucking industry and taxi services, where driverless cars could help solve the problem with the shortage of labor. There are also two major demographics, baby boomers and millennials, that are gravitating to urban living that will push for a solution to the stresses of living and commuting in these environments. Under – It has been projected driverless cars will be in the market for sale within five to seven years. In the market today, it is always a race to get the product out on the market and provide access to citizens. Under – I can’t wait to have a driverless car. This is technology that many people, once they see it and experience it (and it becomes affordable), will likely love having. Under – Autonomous vehicles are already here and will continue to advance in sophistication. Over – Progress of this type is slow. I would like to see it well before 2030, but I don’t know if 14 years is enough time to get states to accept this. Over – While common use of driverless cars may be possible by 2030, it’s hard to imagine them as a widely available option in Des Moines at that time. Over – I don’t have much faith in the driverless car concept. It is a pipe dream, in my opinion. Over – Early tests are promising, but the decision-making algorithm will have a great deal of layers of hazards to offset and prioritize. MICHAEL’S RESPONSE: Workforce. Iowa businesses continue to be challenged with the ability to fill positions with qualified individuals. This challenge highlights the need for policymakers to make progress on immigration reform, as well as Pre-K through 12th-grade education. The recent news of falling test scores is troubling. A vision for the future beyond simply saving jobs. And a level playing field for small business and when it comes to incentivizing growth and entrepreneurial investment. We need more incubator centers for startups. Overregulation. Businesses spend way too much time and money complying with regulations rather than creating value for their clients and shareholders. Being welcoming, supportive to black-owned and other minority-owned businesses. Finding quality entry-level and skilled staff, particularly in retail, restaurants, manufacturing and other traditionally hourly paid positions. Focus on creating progressively unique concepts that set Central Iowa apart from the rest of the country. Investing in long-term programs to improve the environment. Labor and workforce needs. We will continue to be victims of our own successes in some ways — which means we need to be proactive in identifying strategies and finding solutions. This problem will not solve itself. Uncertainty of who will be the next president and what changes will he/she make. Slow overall economic growth throughout the world’s major economies. This is partially due to demographic trends, U.S. household finances for both millennials (repay college debt) and boomers (need retirement savings), and excess production capacities in major industries. Organic profit growth is hard to achieve in this environment. MICHAEL’S RESPONSE: 7 – In this “always on” environment, the separation between work and personal lives is no longer clear. 5 – We have the capability of managing our lives to enjoy the work/life balance we seek. I’ve consciously determined the clients and work I take on drive my work satisfaction. I’ve become more selective over the years. 5 – I have the positive kind of stress that comes with a desire to keep striving for more — more success for our clients, more success for our firm and our people, and more success for our community. Yes, this leads to stress, but it is also energizing and fulfilling. 3 – Would likely feel more stressed, but work for a great company that helps promote a healthy work/family balance. 9 – The Arts and Cultural world is continually going through stressful times as if they were normal. Over time, this wears down capacity and growth. 3 – If I were still in my previous corporate environment, the stress level would be very high. Now, with more control over my schedule and choice as to what I choose to engage in, my stress level is below average! 8 – Very difficult time in the health care field, with the industry transition to value-based care and payment reductions, while at the same time having to pay premiums to find enough qualified staff. Rate the effectiveness of our political leaders. MICHAEL’S RESPONSE: 10, 9, 9, 2, 2 – It is often said that “the closer you are to the people, the greater impact you will have.” Our local city councils prove that every day as they work on the things that are most important to their constituents. 7, 9, 7, 3, 1 – National leadership has no leader to bring people together and collaborate. Obama does not represent business success as it is today; nor does he understand how business is run, managed or operated, making him a failure at knowing how to better our country, the people, its business and financial health. On a state level, I believe Branstad’s longevity stands on its own representing success. He understands the people of Iowa, our opportunities, our gaps and bettering all that is within. He is able to admit where improvements are needed, not brush them off as someone else’s fault. He is a proven leader. 6, 6, 4, 3, 2 – No consensus builders, no leaders. 8, 4, 3, 4, 6 – We’re very fortunate to have strong local leadership in our communities in Central Iowa. However, I’ve been consistently disappointed with our state and federal elected officials, from the oppositional nature of debate to inaction for fear of losing an election or being ostracized from portions of their parties. Both parties’ actions are governed not by wanting to accomplish great things, but by not losing the next election. I’ve also been embarrassed by the actions and words of many of our federally elected officials, especially as of late. 8, 6, 6, 3, 7 – Compromise is a lost art and treated like a four letter word. Civility and professionalism would move us toward addressing needs and issues more than just spouting ideaology. Taking stock: You have $10,000 to invest in one Iowa-based publicly traded company. The only hitch – you can’t sell your stock for at least 10 years. Which company would you invest in? MICHAEL’S RESPONSE: Rockwell Collins Inc.
Casey’s General Stores Inc. – Longevity; continued need for convenience stores in rural Iowa. Principal Financial Group Inc.	– A long history; stable company with good management. Renewable Energy Group Inc. – I am a big believer in renewable energy, and I have seen Iowa already act as a pioneer in this industry. It will not only continue to be relevant, but as technology enhances the opportunity for growth, it will only expand in need and awareness. NewLink Genetics Corp. – Immunotherapy research and treatments are the focus of cancer research and will be for the foreseeable future. There will be a shift away from current chemotherapy and radiation treatments, if the promising research holds true. I am a Komen Iowa board member. Komen is investing in immunotherapy research, as well as research to better fight metastatic breast cancer. Meredith Corp. – I like almost everything about this company, and there is probably a better than average chance after the last go-around that they could be acquired for a premium. If otherwise, nice dividend and a solid media portfolio. Winnebago Industries Inc. – I keep hearing from baby boomers that they would like to travel and like the idea of having a recreational vehicle. I believe that with a mass retiring of this huge generation that we will see a big increase in sales of this nostalgic brand. Quality of life has always been something that they have preached to their children and will be something that they decide to have as a priority in their retirement. This stock may be at its peak 10 years from now, and that would be a good time to cash out. Given the recent cyberattacks on businesses and individuals, rate how worried you are about online data security. MICHAEL’S RESPONSE: 7 – Cybersecurity is of growing concern, but at the same time, companies that battle cybercrime are getting better at measuring risk and implementing effective responses. 10 – Data security is a constant concern in our industry. If you’re not taking a vigilant approach, you’re just asking for trouble. And these days, trouble can mean more than a bad story or two — it can end a business. 10 – Data security is one of the biggest threats facing both businesses and individuals, and the only solution is a constant combination of vigilance, education and technology upgrades to try and stay as close to even (you can’t get ahead) as you can to those who perpetrate these attacks. It’s a daunting situation. 5 – Bad eggs figure out how to do bad things. 7 – It’s foolish not to worry about this. That being said, there are so many ways your security can be compromised that you have no way of figuring out how to protect yourself from, that you just have to count that the safeguards and consumer protections in place will ensure you don’t suffer a catastrophic loss. 7 – I think larger businesses are more exposed because they have a bigger target on their backs, but it is definitely an issue for all business and individuals. 5 – As long as we have windows in buildings, nothing is impenetrable. The same applies to the cyber world. True or False: Long-term, health care reform will be a positive thing for businesses. MICHAEL’S RESPONSE: True - After personnel expenses, often health care is the No. 2 expense for a business. Employees need to be accountable for their health, but also prescription drug prices and the cost of care need to be controlled. True – It is far from complete or perfected, and the Iron Law of Unintended Consequences has been in full force, but if there can be common goodwill for actually taking care of the health of Americans rather than merely vainglorious political posturing (a big if), we might well actually do something good, nearly by accident, as it were. False – It’s just another form of welfare, and the rates continue to go up. It will never be affordable! It’s all a joke! False – You cannot trust politicians. They will not do what is efficient and effective. I have a daughter with special needs, and so far changes have hurt my family. I do not trust our government to fix the problem. True – Obamacare is good in theory but was implemented incorrectly. Need a new system to stop increases in healthcare plus lower premiums. Competition is the key to this. True – If employees are healthy, business will be healthy. True – There needs to be more pressure on insurance companies and more control from the consumer side in health care choices. MICHAEL’S RESPONSE: Slightly negative - My self-employed friends speak often of increased premiums since the passage of ACA. There are positive components, but I believe the next Congress should start looking at revisions to the act. Very negative – Costs for everyone have gone up. Reporting required for employers over 50 employees is a big expense and does nothing to improve the quality of care for anyone. The penalties for not complying with the complicated reporting requirements are significant. Very negative – It has made unaffordable the coverage for people who once had solid coverage and mandated purchase for people who still can’t afford it. Instead of offering a solution for those who didn’t have insurance, it’s mucked things up for almost everyone. Neutral – Better access, but virtually no focus on driving down the cost curve. Pre-existing condition exclusions were an abomination, but public option will probably have to come into play soon in order to rationalize our country’s overall health care spend, and that must be tied to our payers’ (Medicare, etc.) ability to directly negotiate on price. Very positive – As a small employer, it has been very beneficial for us. Before, our rates were greatly affected whenever one team member had health needs. Under the new plan, while we have seen increases in policy prices, they have not been astronomical. Slightly positive – Decreases in part-time hours worked for any one employer now require two part-time jobs. That negative is offset by the lack of pre-existing conditions and greater aggregation of consumers that previously caused people to stay in employment that did not fully maximize their potential value to the overall economy. Very negative – It has caused individuals, small business and large businesses significant increases in providing health care for their employees, forcing the leadership or entrepreneurs to provide comprehensive packages and/or allow for earned raises or bonuses that many families need. This is not the right solution. It does not promote small-business growth, job growth or financial growth, and ultimately hurts health care accessibility for many/most. Yes or No: the Iowa Board of Regents should use the former AIB College of Business campus as the location for a joint Des Moines campus for the regents universities, rather than developing a new downtown join campus. MICHAEL’S RESPONSE: Yes – The former AIB campus is in a great location, close to the airport and downtown. It will be a better use of taxpayer dollars to repurpose existing infrastructure rather than building new. Yes – Come on, people, this is Des Moines — how many people are going to walk to a joint campus regardless of how close it is? And the AIB facility is lovely. I’m not sure – I don’t believe either should be selected if the location lacks the ability to be financially self-sufficient. No – As seen in many other major cities, to truly capitalize on this opportunity, it needs to be located in a highly populated urban area. No – The current campus is unremarkable. If they are willing to level the buildings and redevelop the site, I do believe the location has advantages with a high level of visibility. Yes – This campus is in a good location to serve those south of downtown and complement those offerings that are downtown. No – The whole point of an urban campus for the regent universities is to support the clustering of innovation in downtown Des Moines. This location misses the mark by 2.5 miles. “Innovations cluster in places like Silicon Valley because ideas cross corridors and streets more easily than continents and seas,” as one Harvard economist puts it. If ideas are going to cross the street in Des Moines, they need to be where pedestrians already are made to feel comfortable with sidewalks and crosswalks. Yes – The regents institutions all have an affinity to build more buildings. AIB is a great opportunity to use what we already have and make higher education available to so many more people in Central Iowa, especially nontraditional students. The AIB campus should be shared by the regents schools. Yes – Do not take more property off the tax roles. Yes – This type of collaboration has been tried before. Long-term commitment to these efforts is challenging due to changing leadership. Yes – Why not? The facilities are already built and accessible. I’m not sure – The regents study did not establish a student demand for any programs that are not currently offered in the area by nearly 20 institutions. The study also did not establish a student desire to offer face-to-face classes in the downtown area. The study simply confirmed the desire of downtown developers to see a perceived amenity downtown. Post-traditional learners (working adults and grad students) are rapidly moving to online programs. The need for bricks and mortar to meet those needs is disappearing rapidly. No – The AIB property is a dump. Stop recycling old crap and expecting it to be great. Build something new that is environmentally efficient, technologically advanced and a dynamic place for learning that will attract students. No – The regents universities do not have a good track record of coming together in a common campus in Des Moines. Choice of location is secondary to developing a feasible plan that makes such a joint initiative likely to succeed. Do you believe the Des Moines Water Works lawsuit against the three upstream counties will result in a long-term improvement in water quality for Greater Des Moines? MICHAEL’S RESPONSE: No – The lawsuit itself will not yield an end result of any consequence. I do believe that the lawsuit has sparked a needed conversation about the issue that will likely result in positive actions by policymakers. Yes – Absolutely. The lawsuit triggered real debate about accountability for the irrevocable damage done to Iowa’s waterways over multiple generations. This is probably our biggest long-term risk to our major population centers in the state. Without real environmental stewardship of our natural resources, which includes accountability for protection on the largest pollution sources, we will not be a desirable place to live. It is hard to believe that this is even debatable, Iowans need immediate and significant control and accountability to stabilize and begin to reverse the tragedy of our polluted and dangerous waterways. Yes – Bill Stowe is a talented and capable individual, who has been allotted resources to build a team and make a compelling case for the widespread improvement of Iowa’s water quality and applicable agriculture practices. No – A lawsuit should be the last thing to bring change. There are plenty of organizations such as Pheasants Forever that can work with farmers and Des Moines Water Works to create a mutual benefit. No – It is actually counterproductive, diverting resources from meaningful responses to water quality work. Maybe – Only if it forces/encourages the governor and Legislature to adopt the sales tax option for water quality and recreation. Maybe – Maybe the lawsuit will increase the awareness of the pollution issue and will be addressed voluntarily instead of mandated and litigated by the courts. True or False: the legislature and Gov. Terry Branstad will approve a major new water quality initiative, including permanent funding for water quality projects, during the 2017 session. MICHAEL’S RESPONSE: True – Gov. Branstad proposed legislation during the most recent legislative session to address water quality. Though not perfect, components of that proposal hold merit, and I believe with further bipartisan work, a water quality solution will be reached. True – It will be difficult with decreasing revenues to make a new and sizable appropriation, but I think they will find a way to do so. True – No election coming for two years. True – Because I’m an eternal optimist. And, there is more pressure to get something done. True – Long-term funding is needed to improve the state’s water quality. We all must contribute to do so, including agriculture, businesses, cities and taxpayers. We all have a part to play in the quality of our water; therefore we should all contribute. False – Our government doesn’t work that quickly, and we can’t get enough people to be nonpartisan to make this work in a quick manner. False – Too many competing demands. The previous discussion focused on taking a component of the statewide penny for education to create the funding stream for water quality. Education is already underfunded, and to think that “robbing Peter to pay Paul” is a solution is not good public policy. False – Although discussions will move in the right direction, lobbying groups will make it very difficult to pass meaningful legislation. Rate how concerned you are about the future of Prairie Meadows Racetrack & Casino as it works to appeal an IRS decision that it should lose its nonprofit status. MICHAEL’S RESPONSE: 9 - Prairie Meadows has been a great community partner. If the IRS decision comes down in a way that eliminates or significantly limits Prairie Meadows’ ability to function as it has, Central Iowa will be hard-pressed to replace the contributions that Prairie meadows brings year after year. 3 – The only people losing on this are the people that Prairie Meadows helped with grants. 1 – We should all always be curious and very interested in why some businesses are able to get the rest of us to pay their taxes for them. 10 – Prairie Meadows is a key benefactor to Polk County in both helping to lower property taxes and assisting so many wonderful nonprofit organizations. I would hate to see the IRS take the nonprofit status away and hurt our community. 6 – The casino will exist and prosper but will be paying taxes. 10 – In addition to my full-time position, I hold a part-time position as the marketing consultant for the Warren County Philanthropic Partnership (an affiliate of the Community Foundation of Greater Des Moines). Prairie Meadows losing its nonprofit status would have a large impact on communities, such as Warren County, that receive money from Prairie Meadows. If they lose that status, our community foundation would lose funding and basically be nonexistent. Dozens of other nonprofit organizations in my county rely on that money for items they need, such as body cameras for the Carlisle Police Department, equipment for area fire departments and more. 10 – Polk county has a lot riding on this. The fact that they moved ahead on a convention center hotel that no private business was willing to build and financing this with Prairie Meadows receipts is scary. 7 – I believe Prairie Meadows needs to be more accountable. Yet, its support for nonprofits and community initiatives would be greatly missed if Prairie Meadows loses its nonprofit status. 7 – Charities and nonprofits that have benefited from Prairie Meadows’ success may face some very difficult times if this potential funding source is lost. 5 – I understand why the IRS is doing it, but it is definitely unfortunate, as they donate to a lot of great causes around the metro. 6 – They will figure it out. If the nonprofit status is not upheld, they can make changes to maintain it. 10 – There is much community benefit gained from the various investments Prairie Meadows makes in our community. I do not believe that existing philanthropic structures will be able to “make up the difference” that may be lost should Prairie Meadows lose it nonprofit status. The trickle-down effect is significant, and the impact significant and measureable. 3 – There will be policy-level impacts for financial strategies that relied on their nonprofit tax status. That should be a wake-up call that funding of ongoing costs needs to be backed by tax sources, not peripheral income from sources like gambling. That kind of funding is best allocated for one-time projects that provide a return on investment to society. Otherwise the true costs of public services get subsidized and misallocated. 2 – As a community, we will fill the void should Prairie Meadows lose its appeal. MICHAEL’S RESPONSE: 7 - We should keep building upon the hip-hop presence and offerings in Central Iowa. There is a core group doing some good work, but I see lots of potential for upward growth in not only the number of events, but also the development of local talent and attraction of national groups. Des Moines Culture Week: Spend one week really highlighting the different art options here in the city. Each night is a different event/place — art museums, sculpture park, architecture, Botanical Center, sidewalk art contest, concerts, dances, etc. Have a contest where each person gets a stamp at each event. So much of our state and city has a connection with agriculture and food. It would be interesting to develop an event like Austin, Texas’ SXSW (South by Southwest) event — but leveraging the food, agriculture, biotechnology industry to expose people to our city and highlight the importance of these industries. A monorail system to connect urban and suburban dwellers to events and offerings across the metro. A multicultural museum highlighting how various cultures have contributed to and shaped Des Moines, from Native Americans to present immigrants. An Iowa cultural center that showcases the architecture, history, art and cultures of Iowa all in one place. More affordable places to hold business meetings and events. I think it would be great if downtown Des Moines could create and support a theater district. Even more bike trails! They are driving tourism. More free, low-key outdoor concerts featuring local artists. Ramp up a massive Riverwalk concept that ties all of the current cultural and entertainment venues together (I-Cubs, Court Avenue, Wells Fargo Arena, World Food Prize, plus entertainment venues like Brenton Skating Plaza, river dining, Botanical Center, the amphitheater) with an environment that incentivizes increased investment in one of Des Moines’ greatest assets. Make Walnut Street pedestrian-only and allow this avenue to be robust with cultural and entertainment offerings. Many people will rate this high, as the number of offerings is growing, and that’s true. However, to create a real industry that is competitive outside of Iowa, we need to nurture, invest in and grow our local artists. That is not happening in any major way. Instead we are nurturing organizations. That’s a great thing, but if it comes at the expense of individual artists, we are shooting ourselves in the foot. Beyond better public transportation, investing in our homegrown talent so that it is known outside of Iowa is the best thing we can do to grow our economy long term. We need festivals other than music festivals — theater, comedy, other. We need to grow a diversity of the arts, and support them better. Distribute the hotel/motel tax revenue more evenly among all organizations, not just the largest, most powerful. Utilize Cowles Common more, as we’ve been doing with events such as the Iowa vs. Iowa State game viewing, NCAA party, possibly a Winter Wonderland event, etc. Create a music/arts “strip” or “district” with a concentrated variety of music, art and culture. Des Moines International Airport may build a second terminal as part of a $500 million project that would include added parking and more gates. Do you support the construction of a new airport terminal? MICHAEL’S RESPONSE: Not sure yet – My experience at Des Moines International is always positive, but I am a light traveler. I would need to learn more about their needs before forming an opinion. Yes – Our airport is a major limitation to business expansion and growth. We need travel opportunities to drive business growth. Yes – Long term, there is no question we need additional capacity. Yes – Modernize. We are lacking compared to a lot of other cities. Yes – Improving transportation to and from Central Iowa will be key to broadening our global reach. Yes – I typically travel for work and notice many who do the same. During those times I can definitely see a need for more space. Also I wonder, would more gates open our city up to more direct flights? No – Even though I am in construction and would welcome the work, I feel it is a waste of taxpayer dollars. When I use the airport I do not see signs of overcrowding. I only fly a few times a year, however. Yes – The size of the current terminal cannot support the 2.5 million to 3 million travelers each year. As Des Moines grows, demand will increase. We need a bigger terminal with more direct flights for business travel. Yes – As my technology company expands, the only way we’ll be able to grow and remain headquartered in Des Moines is if we have easier accessibility to travel for meetings with both current and prospective clients in other markets. This expansion I hope would be a huge improvement in making Des Moines accessible to outside business executives and also allow us to travel and connect with companies in a wide range of cities. No – Let’s improve what we have. I haven’t heard a good enough reason not to. Yes – It might attract additional carriers and reduce fares. Southwest has helped, but we still remain an air service-challenged region compared to other smaller-tier cities. Yes – Better air travel with competitive pricing is one of the major things that stop expansion of our market. No – Anytime I’m at the airport, I see gates not in use. Unless there is a projected high increase in usage, I suggest maintaining and updating what we have. Not sure – I have not seen a full business plan that would demonstrate a positive ROI to the airport authority and the region. Not sure – I was opposed to the original plans but have not fully absorbed the revisions to the proposal. I am supportive of the need and importance of expansion and improvements to our airport. Not sure – I have not really paid much attention to this development. Would this bring in new airlines or increase the number of direct flights to cities across the U.S.? I have flown out of the Des Moines airport many times and cannot really recall a time when I had an issue with crowds or getting through security in a timely manner. Is there really a need for an additional terminal? Not sure – The current airport has never been “busy” when I’ve flown out or coming back. If someone could tell me the airport is expected to very overcrowded within the next five years and provide proof, then I could support it. I think roads and highways are a much more immediate need right now. A lot of leaders are concentrating so hard on expansion and how do we get more businesses to Des Moines. I would concentrate more making sure what we already have is thriving first, ensure we have the infrastructure right, and decide how big we want to get. I’ve heard estimates of the population doubling within the next 20-25 years — great, except that also brings higher crime, horrible traffic, and less effective schools. People like DSM because it’s not too big. My opinion is we should try to stay that way as much as possible. No – The airport does not seem crowded enough to spend half a billion dollars. Yes – Overcrowding of the airport would be bad for business and pleasure travelers.